We showcase short films from upcoming filmmakers from around the world. 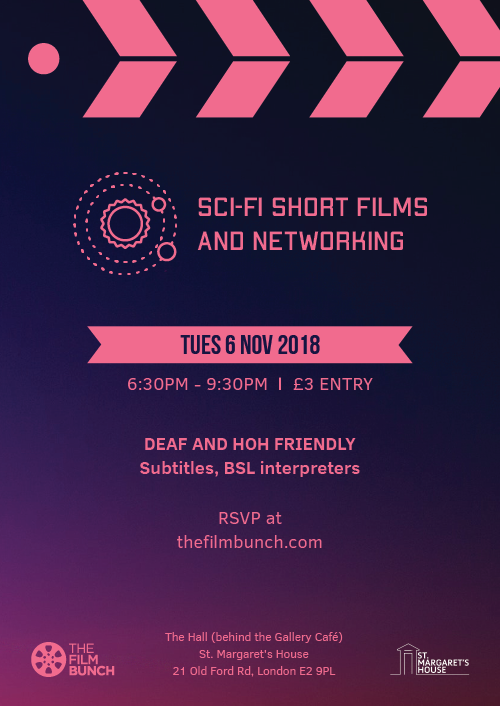 Our mission is to improve access for deaf and hard-of-hearing people to mainstream short films, so we provide English captions and BSL interpreters. Which sci-fi character will you find in a bakery? The Breadator. Yep, this November, we're bringing a sci-fi themed screening to you that's out of this world. Join us as we screen some of the best short films and eat popping candy. If you'd like your short film (under 20 minutes) to be considered for this event, please email it to info@thefilmbunch.com. If it has no captions, you will also need to send a script or transcript. We'll kick off with networking at 6:30pm, films will start at approximately 7pm, and then we'll wrap up with networking so you can meet more awesome earthlings. Tickets are only £3. We recommend booking online to save your space. No one turned away for lack of funds - please email us in advance if you would like to attend but funds are a barrier. A great opportunity to check out new talent and find collaborators, come join us for a fantastic evening! Event is 18+. How to get there: The nearest station to St. Margaret's House is Bethnal Green. We are in The Hall (behind the Gallery Cafe), opposite the V&A Museum of Childhood. Venue is wheelchair accessible. Special thanks to St. Margaret's House for hosting this with us.